How Wikipedia Works: And How You Can Be a Part of It is a book by Charles Matthews, Phoebe Ayers and Ben Yates, published in 2008 by No Starch Press. 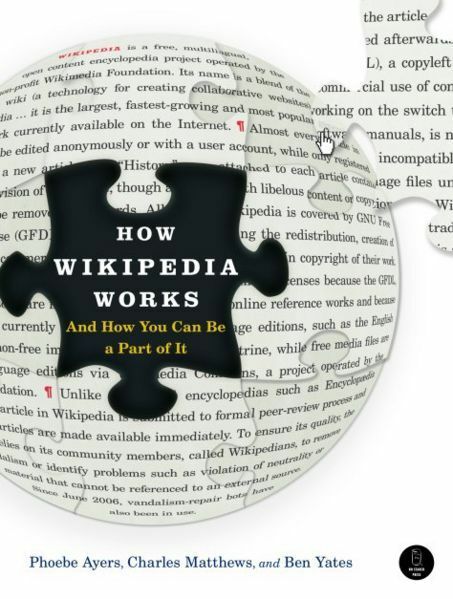 It covers editing, using and understanding the remarkable free encyclopedia, Wikipedia. Phoebe Ayers is a Wikipedian and librarian at UC Davis; she maintains a personal site at phoebeayers.info. The best way to contact us is through our Wikipedia talk pages. 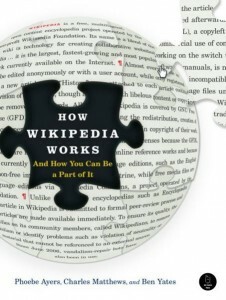 How Wikipedia Works is a free cultural work. It was originally published under the GFDL license. At the time of publication, Wikipedia itself was released under the GFDL. Phoebe Ayers and Charles Matthews also relicense the book under the CC-BY-SA license, as Wikipedia itself now uses this license. The authors encourage re-use, translation, updates, and re-mixing of the book. The full text is available on the Internet Archive. The webpage for the book was originally at howwikipediaworks.com; unfortunately, the domain registration of that site expired and was registered by squatters, and it is now no longer affiliated with the authors, although the current registrants are maintaining a copy of the original site. Perhaps they’re fans! The book can be purchased from the publisher, No Starch Press; via Amazon.com; or ordered from any fine independent bookstore. The paper version features a detailed layout and index and lay-flat binding. An eBook version is available from the publisher; from Safari Books Online; or from Amazon formatted as a Kindle book. The full text is also accessible online.